– Student paced – with a ‘playlist’ of activities, students would work through the editing process at their own pace. Having a ‘soft’ deadline, rather than the same date helps with this. – Mastery (progressive) – students were not allowed to advance until the next stage until the previous had been completed. – Dynamic grouping – break out sessions to help students struggling with particular aspects of the essay. There were a couple of occasions where students were idle (e.g. when waiting for a peer or me to check work). During these times students were encouraged to participate in anchor activities (activities to stop them ‘floating away’), including ongoing vocabulary, reading and grammar work with the iPad iTooch software or DEAR reading. – and best of all: marking and feedback time for me was vastly reduced in terms of intensity – marking was more ‘spaced out’, which meant that I could get feedback to the students more quickly as well. Normally, my classroom looks like this. Four groups of tables together, with me as the teacher either at the whiteboard or floating around the classroom. While I really enjoy the small group-based, collaborative learning, I felt that I had no real way of thoroughly and comprehensively checking for understanding. Also, some more advanced students would become bored and might become frustrated having to take all the responsibility to help the lesser-abled students all the time. Lessons proceeded at a uniform pace, dictated by me, whether learning was happening or not. To address this problem, I thought that I could adopt mastery and dynamic grouping ideals to slightly transform my classroom. While I have often kept my four groups of tables, I have sometimes shifted the classroom into a large ‘U’ shape, with tables facing the wall. In the middle of the ‘U’ I have kept a slightly larger table. Now, after exploring a significant piece of content with the students, I have taken to using socrative.com as a piece of technology to instantly assess who is understanding a particular concept and who is struggling. The next lesson, when a student comes in, they get to go to personal learning time (PLT) with a set ‘playlist’ of extension activities for the particular topic we did the previous day. If they did not perform well with the quiz, I sit with them in the middle table and go through the exercises in a different way. I then asked them to take the quiz again and only when they had achieved a perfect score would they be able to go to PLT as well. So far I have done this twice. The first time students were writing an analytical essay on themes in a novel. After doing some drafting, students were asked to join the middle table for one or more of the areas of need that I identified (content, organisation or style and language mechanics). I then held mini-writer’s workshops for these activities. The second time we were looking at literary devices in poetry – we completed the activity in a similar manner, each time using socrative.com as a tool to gain instant feedback. The key differences were that I have now split my role in half. For the first lesson (or exposition lesson), I maintain my traditional role and classroom structure. For the ‘confirmation of understanding’ lesson, I set up the PLT playlists, use technology to more frequently assess student understanding, and become a small group coach. In this brief time I have noticed in the students an increased desire to ‘get the questions right’ rather than brush off understanding of similes, metaphors and idioms as useless knowledge. Transitioning between activities is still noisy and clunky, so I have some work to do here. I would like to continue this process, but rather find a way to announce student groupings (PLT or coaching?) in a more indirect, discrete manner to avoid embarrassment. Also, the room is small and so I need to devise a way to do the oral coaching while not disturbing the extension PLT students – perhaps a different space? Overall I hope this written account gave you a clear idea about the change I have implemented and my thoughts on the process. Not as interesting as a video I know, but thank you for taking the time to read and offer any feedback – I really appreciate it. 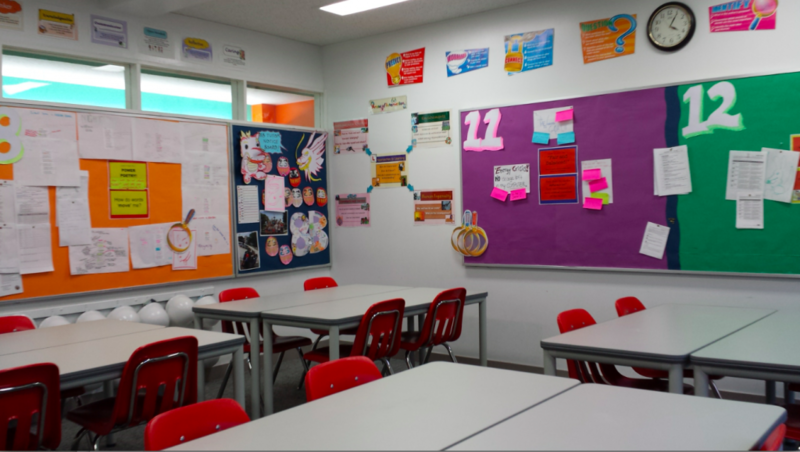 PS: I have attached a photo of the ‘traditional’ classroom layout I typically use for an exposition lesson. For the follow-up coaching, if you could imagine most of the tables up against the wall with chairs facing the wall and one grouping of tables in the middle. Our students have a 1:1 Mac program which makes implementing this PLT time pretty easy! As a part of my Coursera course, I was expected to design and implement an aspect of blended learning in my classroom and submit it for peer evaluation. I will post my summary in a following post, however I wanted to put the link for one school I was responsible for peer assessing – the difference in appearance of the students from ‘before’ to ‘after’ was quite stark. Before the new blended learning process was implement the students seemed quite passive, even bored. The teacher was ‘the sage on the stage’ and seemed to be doing all the work. In the second video, the increased energy, activity and enthusiasm among the students seems quite palpable. Thank you to Seton High School for sharing your trial! I am approaching the end of my Coursera blended learning course, and now it is time to put the theory into action! Whole course: replace an existing course. Software does most of teaching/learning. Teacher is purely to drop in and check progress. Examples: Apex Learning, K-12, Edgenunity. Easier to use, but less personalised. Supplemental: support core course. Teacher still designs and delivers main learning experiences. Examples: ST Match and Dreambox Learning (is adaptive). Khan Academy (called ‘the gateway drug into blended learning’) – free resource for mastery. English language arts: Achieve 3000 (current event topics and rewrites at different lexile levels); Accelerated Reader (quizzes on books that they read based on lexile level; creates virtual book shelf). Gobstopper, lightsale – ebooks for schools; providing opportunity for teachers to embed quizzes or notes. Learning apps: length, frequency of use very different; depended on unit and child. App: Poetry – search and display on mobile phones. – What do you already have? Existing subscriptions? Start here.